Yair Lapid, leader of Israel's new Yesh Atid party. The secular mainstream in Israel scored in the recent elections with the success of the new party Yesh Atid (There is a Future), led by talk-show host Yair Lapid. Though Benjamin Netanyahu’s party won, Lapid emerged as a power broker. One of the planks in his platform is the demand that ultra-Orthodox students serve in the military or suffer sanctions. The Supreme Court has already nixed a law giving exemption to such students, but the government has not followed through on bringing them into the military. His position on Jerusalem could also become an issue. In the campaign he took up the traditional Israeli election rhetoric of “undivided Jerusalem.” This wins votes. Yet his record shows a different side. In 2008 he gave an interview to Der Spiegel indicating support for the division of the city with the Palestinians. This past week one of his security advisors, Jacob Perry, answered a question about Lapid’s inviolability of Jerusalem stance indicating that it may be the starting point for negotiations. In other words, compromise may be necessary. There is much to be said on either side of the debate over Jerusalem. Both Israelis/Jews and Palestinians/Arabs/Muslims have staked a claim. Identity and ideology play vital roles for all concerned. Can ideologies be modified and identities change? Yes. But only with new perspectives on the human condition. The upcoming anniversary of the 1967 June War, or the Six Day War, is an opportunity to reflect on the power of identity and ideology. 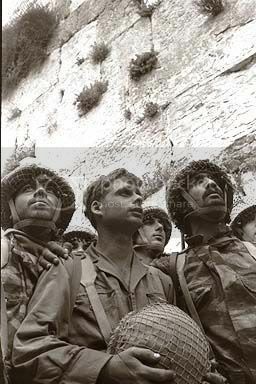 Israeli paratroopers (Zion Karasenti, Yitzak Yifat and Haim Oshri) at the Western Wall on June 10, 1967. Photograph by David Rubinger. Licensed for Vision.org by Getty Images Editorial. A significant reminder of the ongoing Middle East conflict comes with the 40th anniversary of the day the Old City of Jerusalem fell into the hands of the Israel Defense Forces on June 7, 1967. Israelis will commemorate Jerusalem Day on May 15-16, the equivalent date on the Hebrew calendar this year. 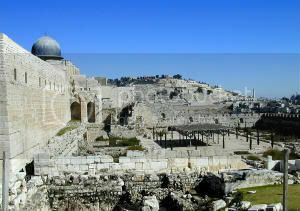 From the perspective of Jerusalem, nothing was more significant in the war than the Israeli capture of its eastern half, including the Temple Mount. According to Ha'aretz journalist and novelist Amos Elon, the Western or Wailing Wall suddenly became “a monument in the domain of memory and of faith” for the Israeli people. Within Israel, the capture of the Temple Mount catalyzed the desire to make something profoundly religious out of the otherwise political. Even the nonreligious became religious that day. 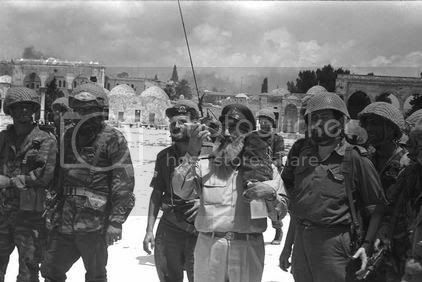 Colonel Mordechai “Motta” Gur had been born in the Old City and led the paratroopers who were the first soldiers to arrive at the Temple Mount. He told the soldiers who had gathered at the Wall, “It is impossible to express what we feel in words. We have been waiting for this moment for so many years.” When he paid his own visit to the Western Wall, he connected with his past. He wrote: "Despite the great congregation, I had to undergo my own private experience. I did not listen to the prayers, but raised my eyes to the stones. . . .
"I remembered our family visits at the wall. Twenty-five years ago, as a child, I had walked through the narrow alleys and markets. The impression made on me by the praying at the wall never left me. My memories blended in with the pictures that I had seen at a later age of Jews, with long white beards, wearing frock coats and black hats. They and the wall were one." On June 12, he assembled with his paratroopers on the Temple Mount and spoke to them even more pointedly in the language of identity: "You restored the Mount to the bosom of the nation. The Western Wall—the heartbeat of every Jew, the place to which every Jewish heart yearns—is once more in our hands." Gur continued, "During the War of Liberation, mighty efforts were made to recover for the nation its heart—the Old City, the Western Wall. These efforts failed. "The great privilege of finishing the circle at long last, of giving back to the nation its capital, its center of sanctity, has been given to you." Much of this material, its sources and much more is covered in Identity, Ideology and the Future of Jerusalem. Next time, Uzi Narkiss rejects a suggestion from a religious leader to destroy the Muslim shrine, The Dome of the Rock. The daily news reports of terror, the televised sound bites from devastated Palestinian towns and villages, Israeli shopping malls, markets, and buses, are about people and the conflict and passion generated by identity and ideology. Thinking about how people’s identities and ideologies explain their actions in respect of the Arab-Israeli conflict and the Jerusalem Question yields some important conclusions. One of my goals in “Identity, Ideology and the Future of Jerusalem” was to look again at individuals in leadership and follower roles in the context of their identities and ideologies. What do the Palestinians desire in respect of the city? Why have successive Israeli leaders failed to come to agreement with them over the city’s sovereignty? Despite different stated policy positions, why is there so little apparent distinction between Israel’s Kadima, Likud and Labor parties when it comes down to the resolution of the problem? Erik Erikson, the “father of identity studies,” has much to offer by way of explanation of the dynamics involved. His conceptualization of identity and ideology as essentially two sides of the same coin helps. But more importantly, he shows that identity is more malleable than we think and modification occurs across the entire human life span. Everyone can change and it is never too late to change. There is hope for what seems the world’s most intractable problem. Palestinian and Israeli officials have called for direct negotiations between the two parties, aimed at reaching a final solution to the conflict, regardless of the precondition of a ceasefire. Jerusalem is the head, the heart of the Palestinian state—the heart of the Palestinian identity. “The problem of Jerusalem is one of the most emotional and explosive issues in the world,” wrote Palestinian international jurist Henry Cattan in 1981. Explosive, contentious, capable of drawing in much of the world community—this is the pervasive nature of the problem. Illustrating this point, in 1999 two of the foremost actors in the Oslo peace process commented on Jerusalem as a final-settlement issue. The Speaker of the Palestinian Legislative Council at the time, Ahmad Quray‘ (also known as Abu Ala’), explained that Jerusalem . . . is the head, the heart of the Palestinian state—the heart of the Palestinian identity. Without Jerusalem, I don’t think peace will be achieved. Therefore, this is the most important element of the peace process. At the same time the then Speaker of the Knesset, Shimon Peres, said: Jerusalem may be the only issue on the Israeli position which escapes strategy and politics. This is the only place that has the aura of holiness. And the difference between politics and holiness is that when holiness begins, compromise stops. Both statements reflect the language and underlying strength of identity and ideology as a nexus and invite consideration of the dynamic that seems to bring either stasis or momentum over the Jerusalem Question. Bethlehem is meant to be the city of peace," Archbishop Michel Sabbah said in his Christmas message, referring to the birthplace of Jesus, located in the Israeli-occupied West Bank only a few kilometers from Jerusalem.